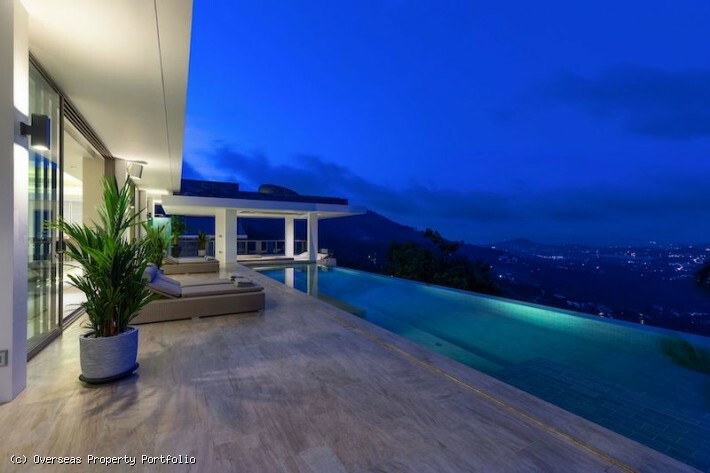 This unique and absolutely stunning Koh Samui villa for sale sits on a picturesque hillside and in a great location between the beautiful beaches and exciting night life of Chaweng and Lamai. 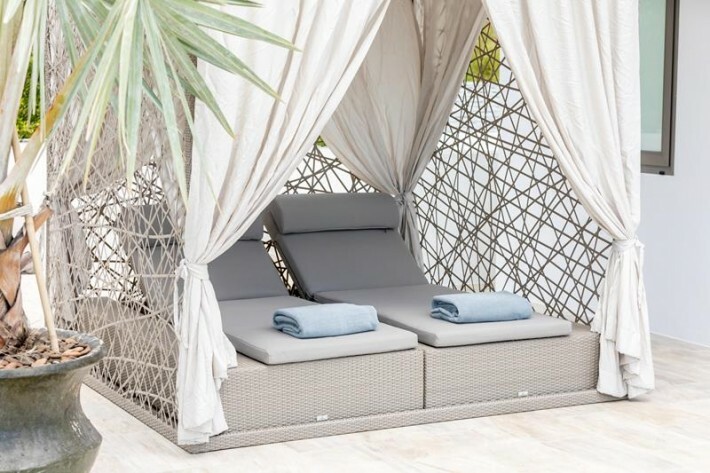 Completely walled in and built on 1 Rai of landscaped gardens with mature tropical trees, this property is very private and peaceful and away from the hustle and bustle of the tourist life, yet close to all the fun and amenities making it ideally suited for holiday rentals. 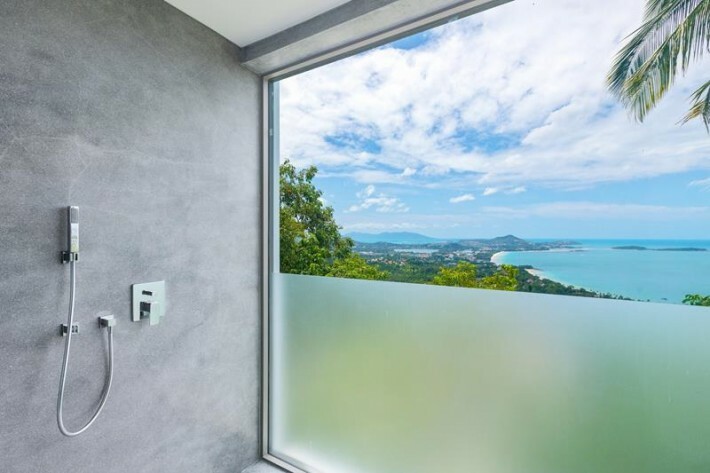 Built to the highest specifications and furnished with the utmost attention to the smallest detail, this exclusive Koh Samui villa for sale exudes pure luxury and offers the best of contemporary tropical living along with jaw dropping panoramic views to the sea, the North East coast of Koh Samui and the neighboring island of Koh Phangan. 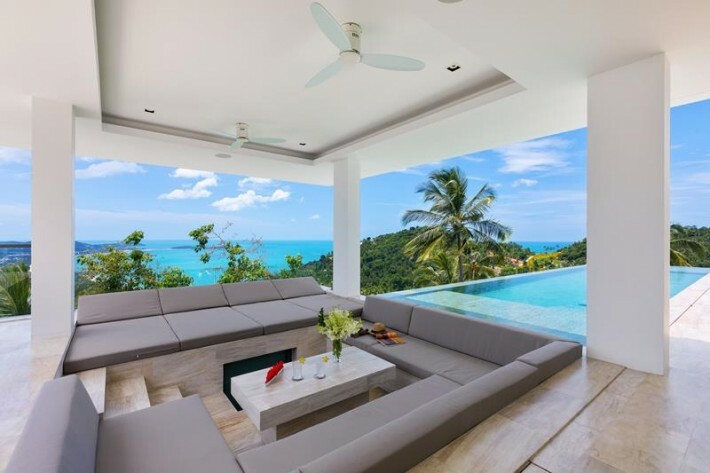 Built with personal design, flair and creativity this villa is finished with attention to detail rarely seen in properties on Koh Samui. 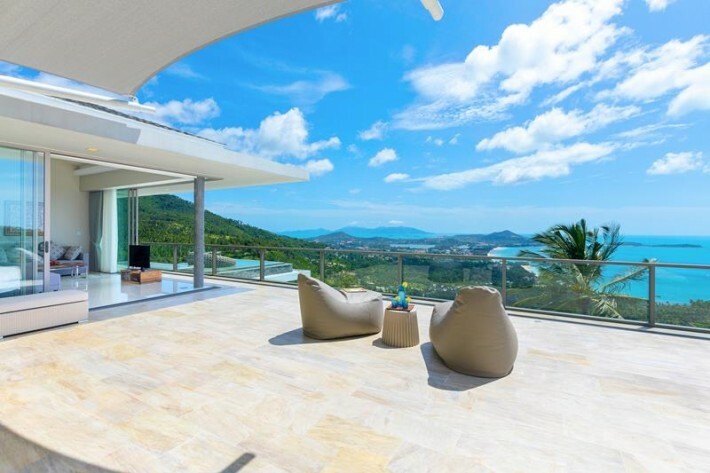 The palatial Koh Samui Property for sale is spread over four floors and provides abundant indoor and outdoor living space. 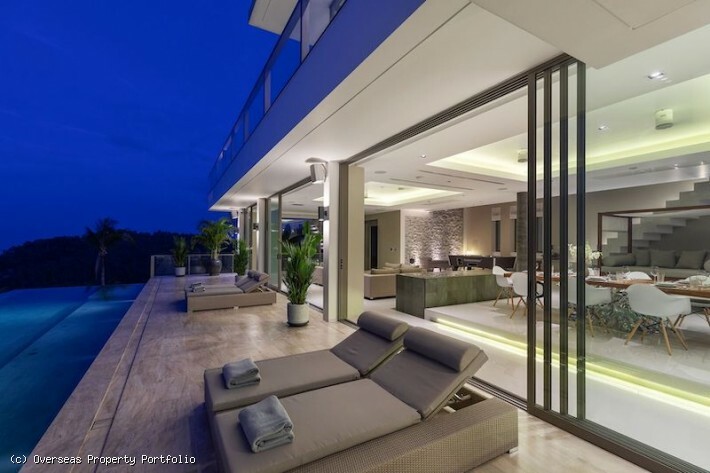 On entering the grounds, there is a large garage for 2-3 cars and a waterfall wall. 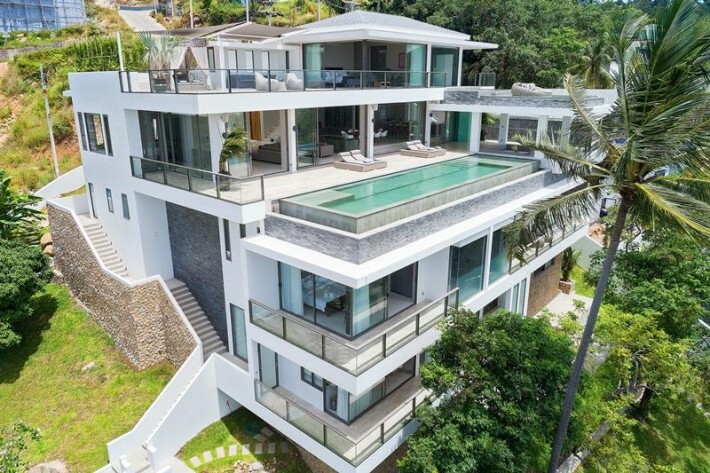 The oversized villa entrance door opens onto the spacious main floor of the property with light shining in from the glass ceiling and immediate views of the inviting 16x4m infinity edge swimming pool overlooking the sea. 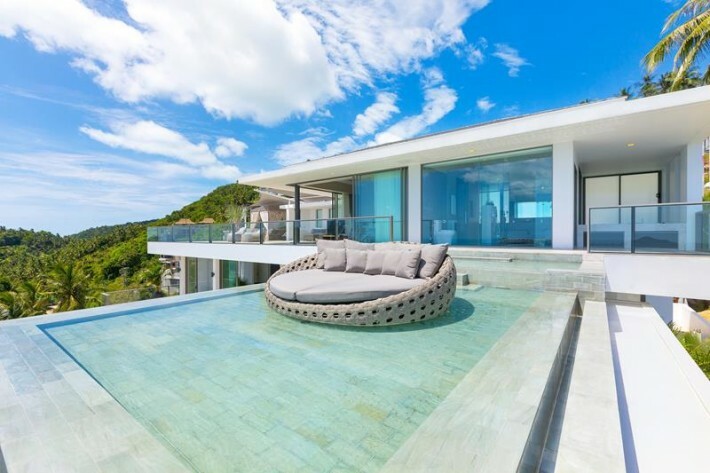 To the pool side there's a sunken sala with comfortable seating, perfect for entertaining or simply enjoying the views. 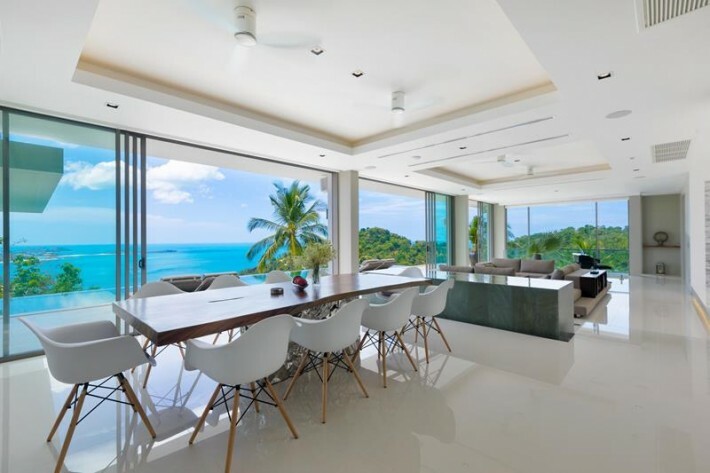 The 160 sqm open plan kitchen living and dining area boasts a 3.40m high ceiling. 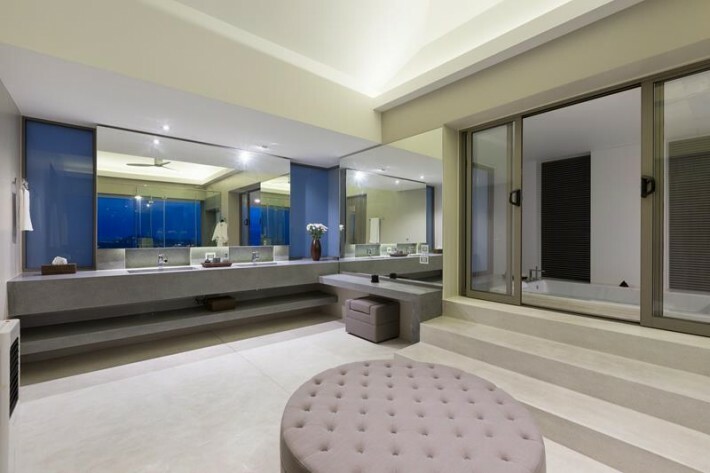 The dining area has a large Acacia wooden table and designer stainless steel base and is visually separated from the living area by an indoor water feature and LED-lit step. 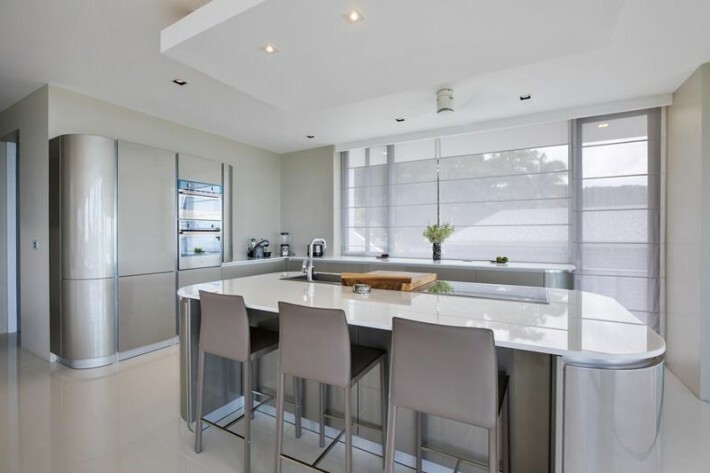 The modern and bespoke kitchen is equipped to the highest standards and features premium Franke appliances. 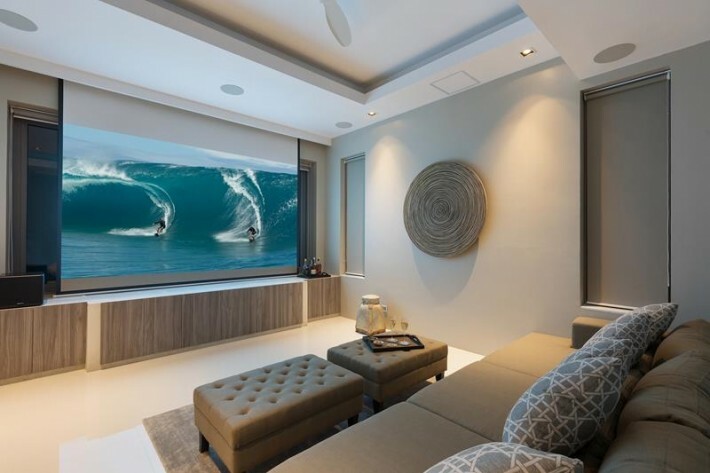 To the rear is a cinema room with a large retractable projector screen operated via smartphone. 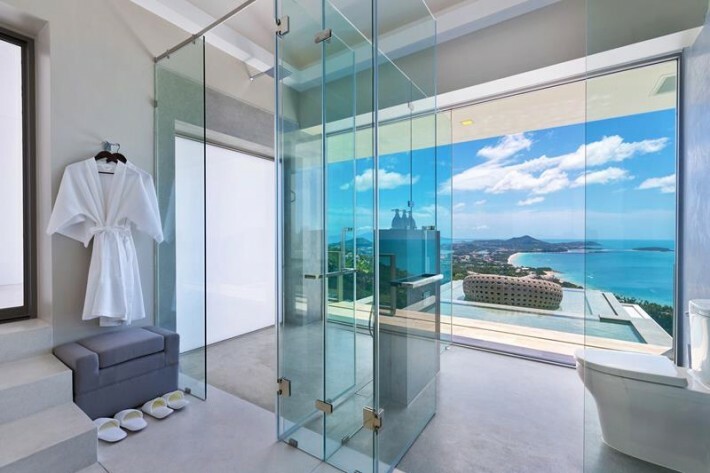 From the living area the floating terrazzo-clad steps lead up to the top floor with 80sqm master bedroom, featuring a generously sized walk in wardrobe and minibar. 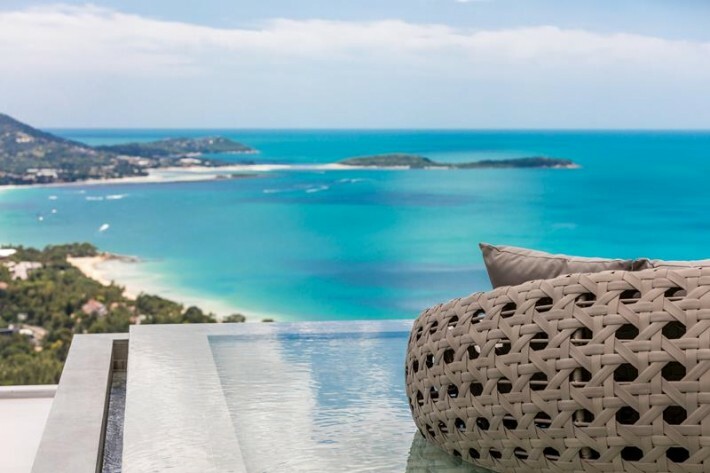 Opening on to a private terrace with amazing views and several shaded lounge areas. 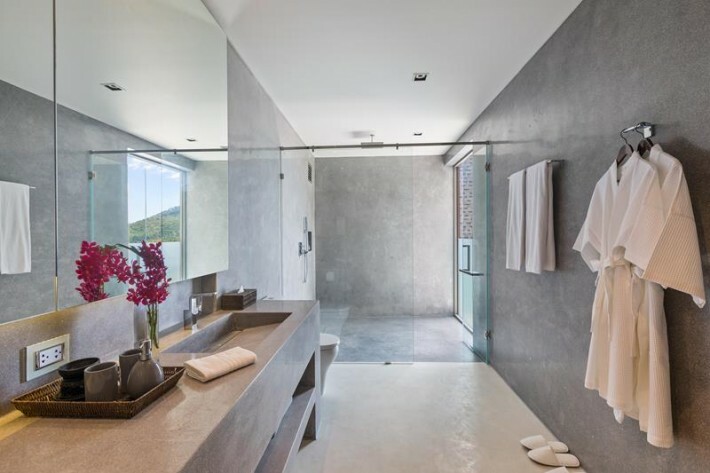 A double door leads to a generous bathroom with twin basins, rain shower and a toilet with a waterproof magnetic launch port for tablet device. 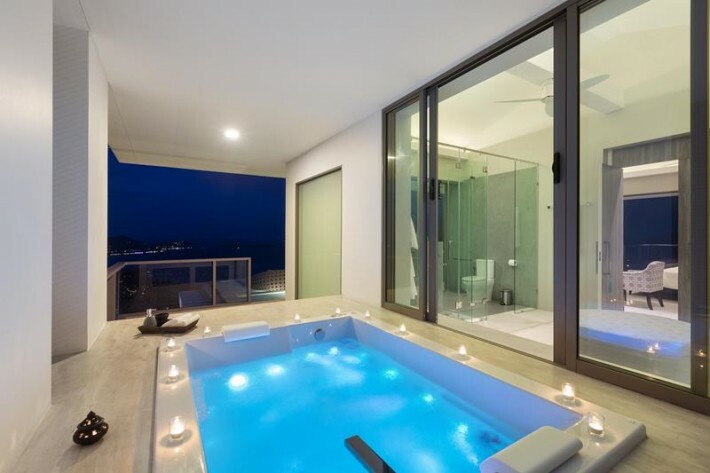 The impressive bathroom and outdoor jacuzzi boasts the same panoramic views as the bedroom and overlooks a 4x6m infinity water feature with large round daybed. 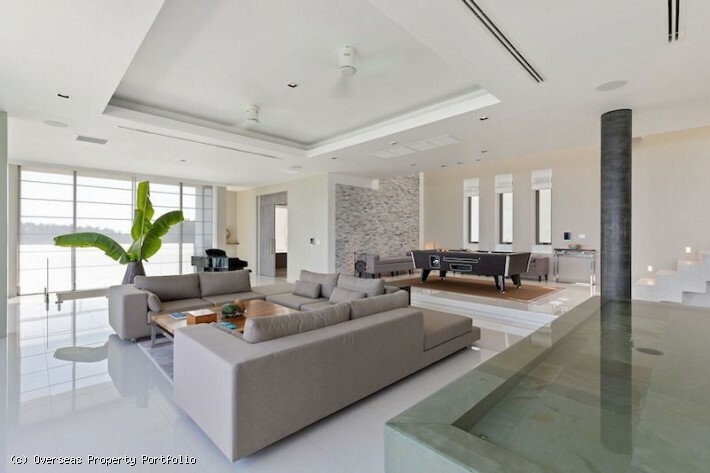 From the living area, stairs go down to three double bedrooms each with an ensuite bathroom. 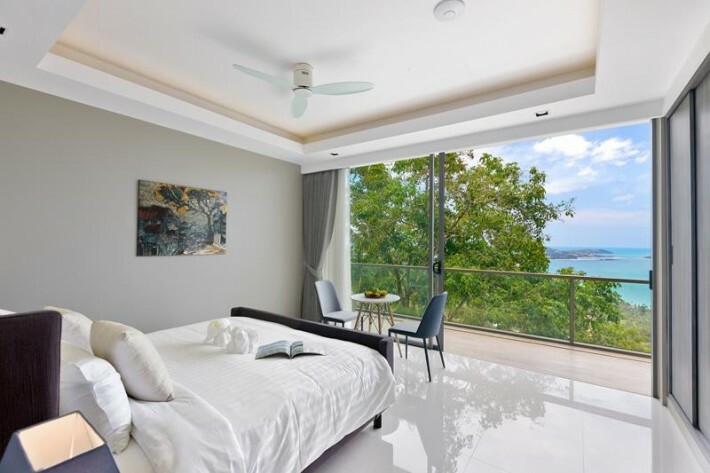 All bedrooms have floor to ceiling sliding doors and open onto a wrap-around balcony overlooking to the coastline of Chaweng and beyond. 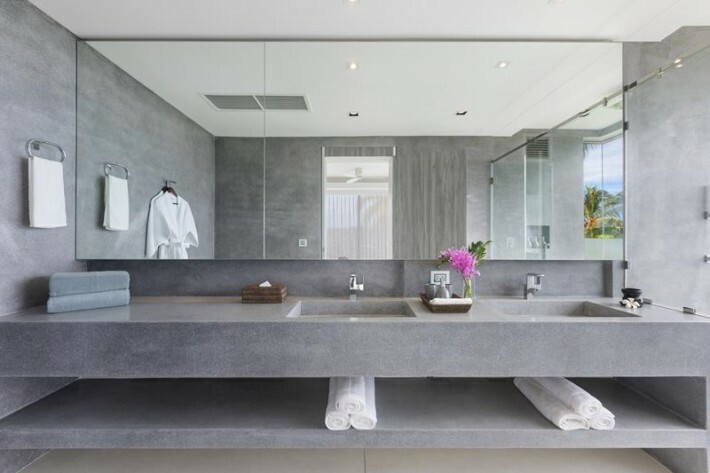 The terrazzo bathrooms feature twin basins and rain showers. 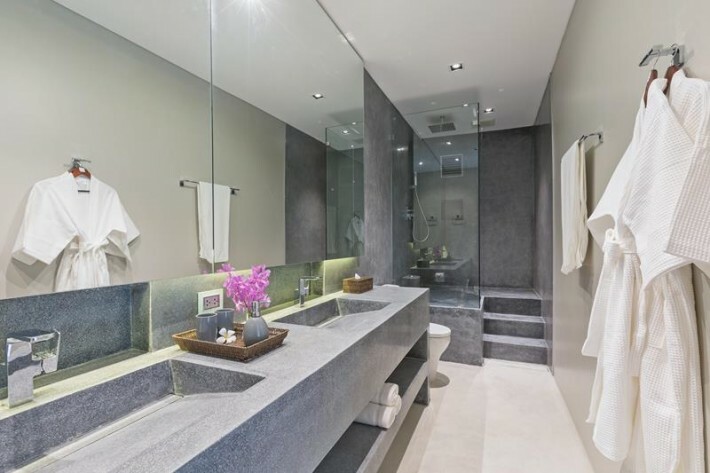 On this level there is the access to the pump room and electronics for the CCTV and sound system throughout. 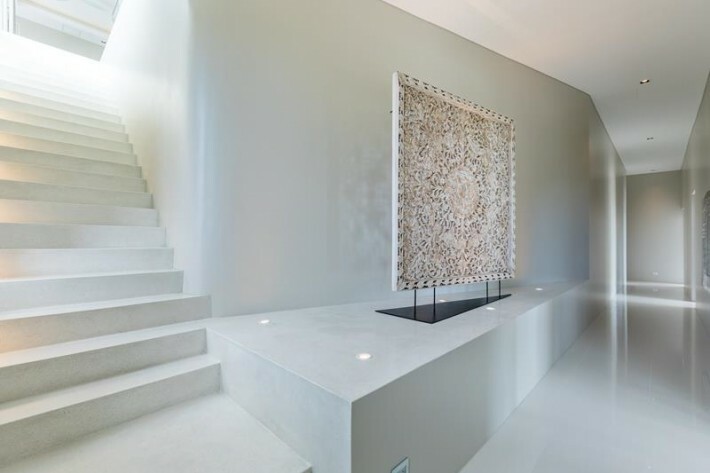 A door leads to stairs which takes you up to the garage or another way to the lower floor. 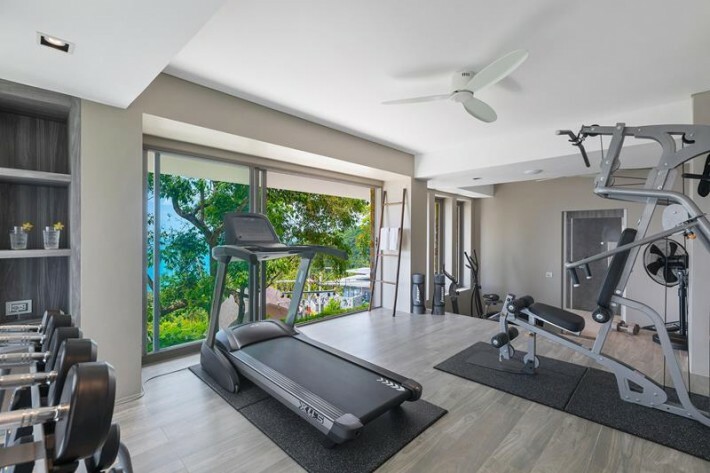 The floor below has a fully equipped gym with changing area and Jacuzzi bath and a self contained sea view apartment comprising of an open plan living and dining area with a kitchen and two ensuite bedrooms, one boasting an outdoor bath. 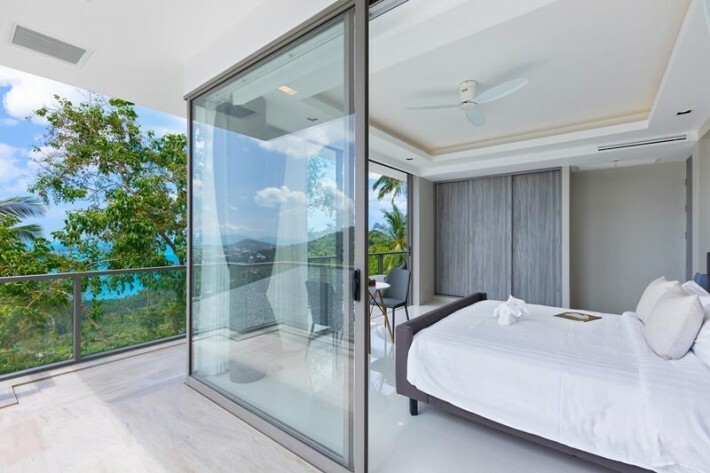 The bedrooms open onto a wrap-around balcony and enjoy fantastic sea views. 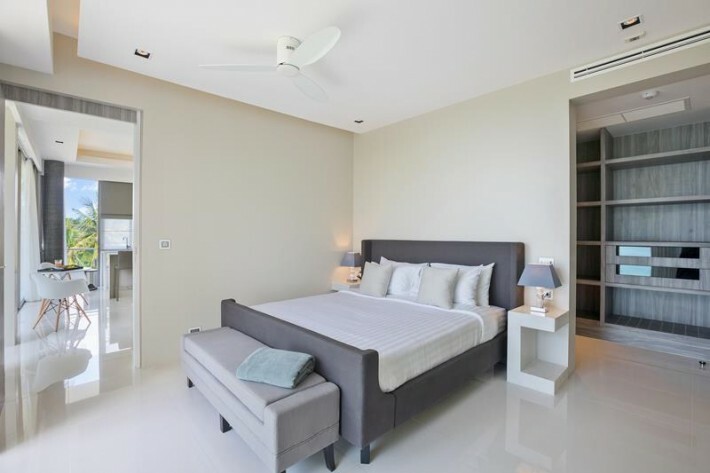 A revolving bookshelf in one of the bedrooms leads to a “secret” room...you decide its purpose! 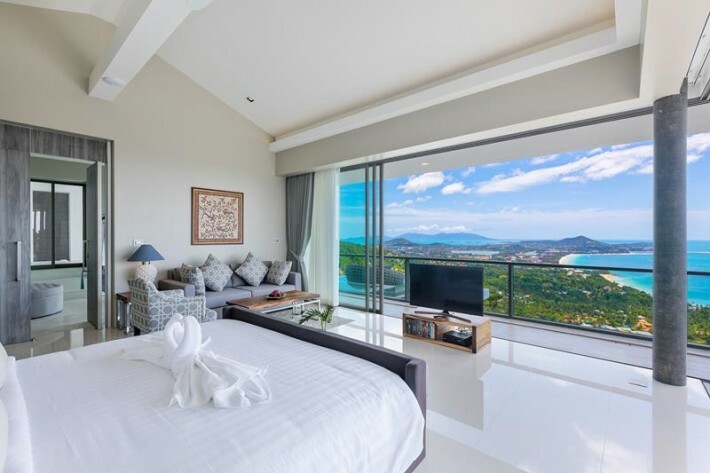 The cozy apartment can be accessed either via an external staircase or from its own separate parking area at the bottom of the property. 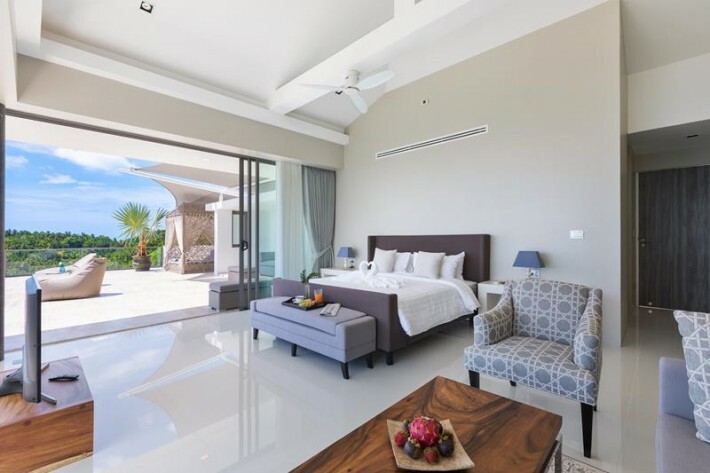 As the apartment is separate, an option is to live in the the apartment and rent the upper villa as 4 bedrooms. 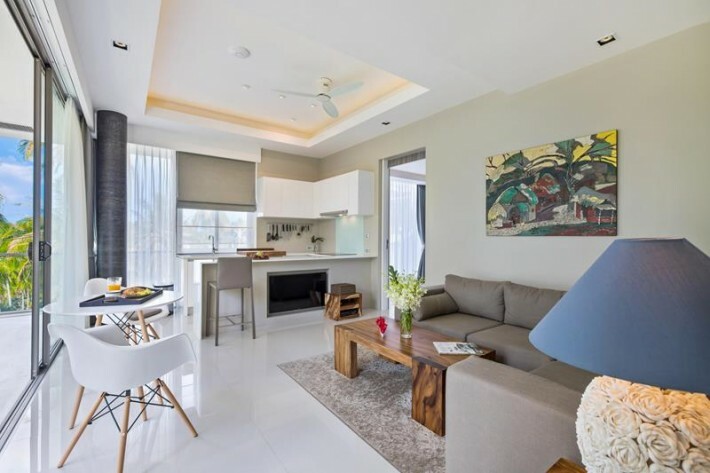 Accessed from the parking area is a Thai kitchen and stairs leading down to a billiard room, ideal fo those super hot days or just taking time out chill and the maids quarters. 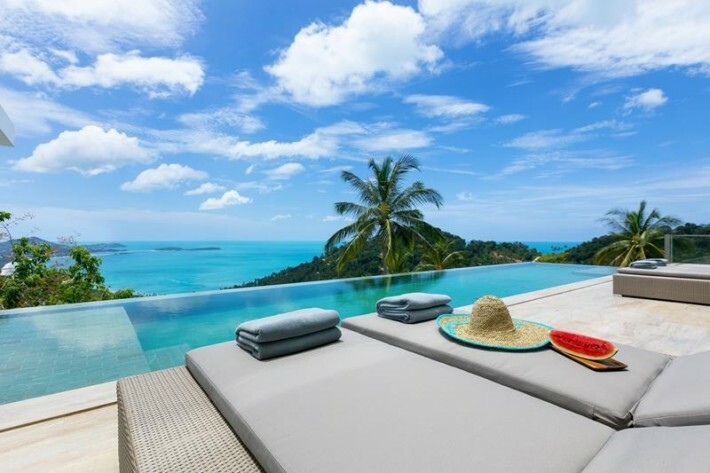 This unique Koh Samui villa for sale has been beautifully designed and furnished throughout buy it's owner, using bespoke and high quality materials, a truly unique and special Samui villa. 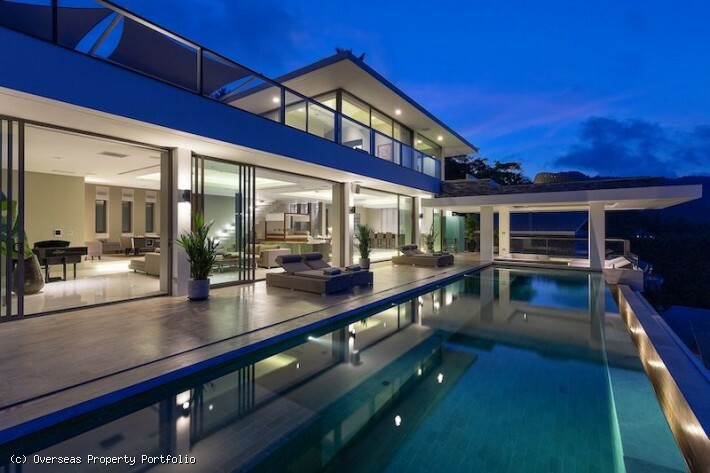 It boasts energy efficient double-layer exterior walls and full roof insulation to minimize heat and energy consumption. 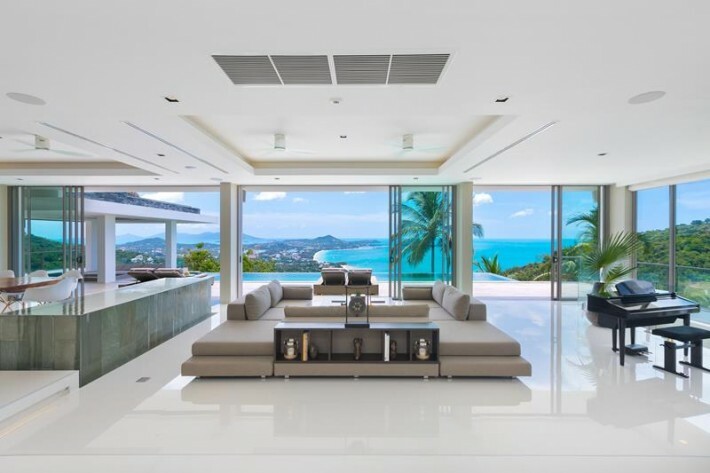 Most indoor living areas feature minimum 2.80 m ceilings and the panoramic glass doors and windows throughout add the wow factor to the villa and maximize the views to create the sense of space and brightness. 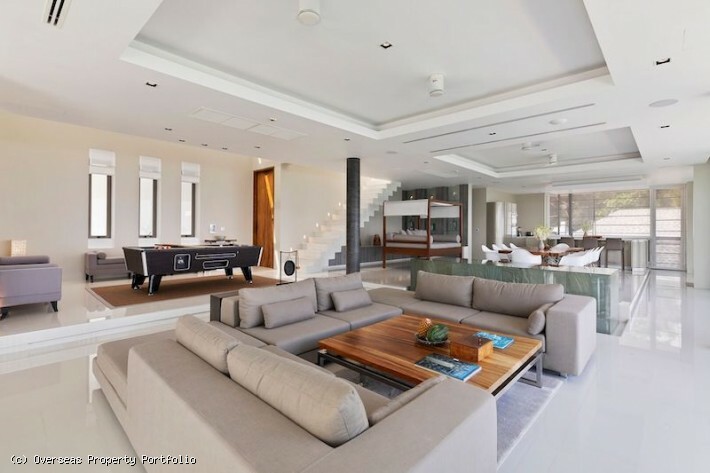 A Control 4 Home automation system manages lighting, the built in multi-zone TruAudio sound system, the cinema room video and the air conditioning on the main and master levels by smartphone/tablet. 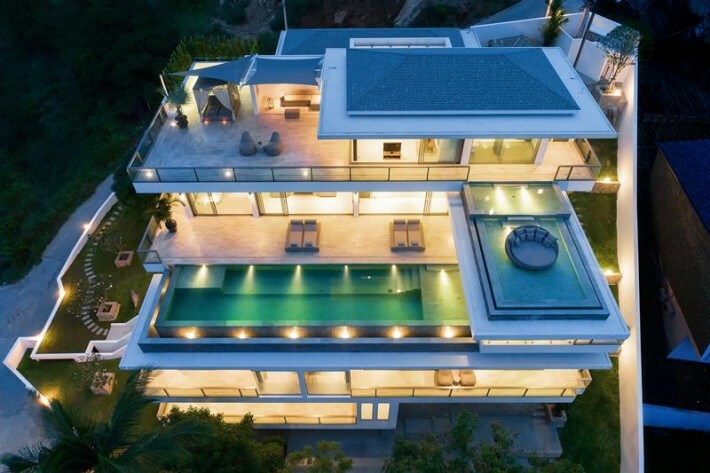 And for your peace of mind the property is monitored by 14 CCTV cameras. 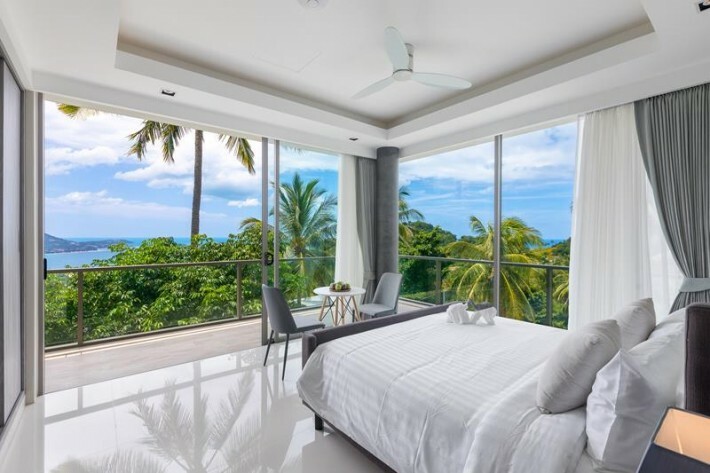 This extraordinary villa is Ideally located for both living and investing as the airport, shopping centres, nightlife in Chaweng, the boutique dining and shopping areas of popular Fisherman's Village and The Wharf in Bophut, supermarkets, International schools and hospitals along with wonderful sandy beaches are all just 5-10 minutes drive away.